The European roulette wheel is the most played game of online roulette games because of its lower house edge (2.7%). European / French Roulette Wheel shown. 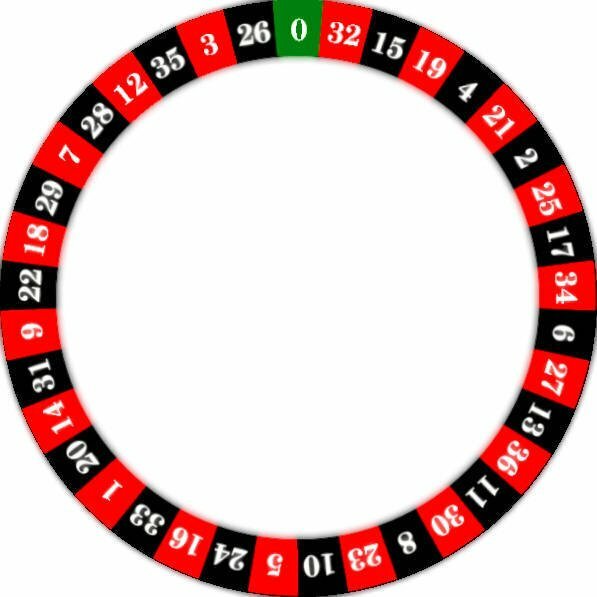 The French roulette wheel is a contrasting theme of reds and blacks, broken by a single green slot. There are 37 numbered compartments from 0 to 36, though no ordered numerical sequence is adopted, there is a correlation between the color and whether a number is odd or even. 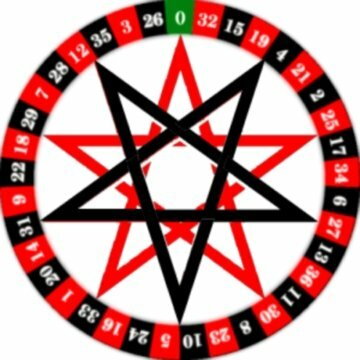 As there are '8 RED EVEN' and '10 RED ODD' and in comparison '8 BLACK ODD' and '10 BLACK EVEN' roulette wheel/table numbers. French and European roulette wheels have only one green coloured slot, the zero number. Each number changes color repeatedly between the roulette signature colors of red and black. The American roulette wheel has an extra green compartment for a double zero '00' number. Shown in the picture below. Double Zero '00' the extra compartment added to the American roulette wheel, diagonally opposes the single zero '0'. But the extra double zero isn't the only modification made. The American roulette wheels number sequence in comparison to the European/French wheel, is completely different too. Though each numbers color hasn't changed i.e. black 22 is still black 22 in both wheel types. The frenetic randomness of the French wheel sequence is less so in the American wheel with regards to diagonally opposing numbers bearing some relation to each other like 1 and 2 oppose each other, the pattern continues up to 35 opposing 36 possibly done this way as the zero and double zero face one another to bring about a pleasing symmetry when in designing the American roulette wheel. The Roulette Wheel with the single green slot marked as a , is of the European and French Roulette wheel games. Compare this to the American Roulette Wheel which has one more green slot on the wheel marked as a  and you can see that your chances of winning are reduced by this additional green slot. The Casino has nearly a 3 percent advantage over the player with the Roulette Wheel pictured on the left and just over a 5 percent advantage with the American Roulette Wheel. Playing online you have the choice of both wheels.